Versatile for a range of activities, 1000 Mile Cross Sport Socks can be used across multiple types of training and active recreations where comfort and support are essential. 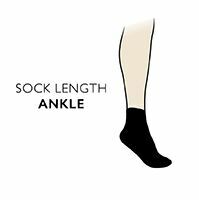 An anatomical design, with a perfect left/right specific fit, precisely places defensive padded zones, structured support and ventilation throughout these single layer, mid-weight men’s socks. A soft but durable fibre blend is used to optimise moisture management, and reduce friction and irritation, along with flat, smooth toe seams. The design also provides a built-in arch brace to prevent sock slippage during exertion, when you least want it.